[Any person who] owing to the well-founded fear of being persecuted for reasons of race, religion, nationality, membership of a particular social group or political opinion, is outside the country of his nationality and is unable or, owing to such fear, is unwilling to avail himself of the protection of that country. 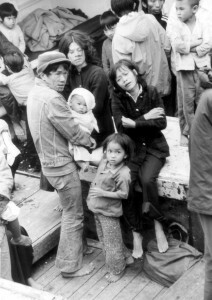 With the arrival of nine Vietnamese boat people in 1975, hundreds of boat people started reaching Japan from Indochina every year (Vietnam, Cambodia, and Laos). In response, Japan ratified the UN Refugee Convention in 1981, which paved the way for the development of a legal framework for receiving refugees. Shortly thereafter in 1982, the Immigration Control Act was revised and the refugee admission system was introduced. Since then, due to numerous geopolitical conflicts around the world, people have continued to be displaced in even greater numbers from many different countries of origin after being forced to flee disparate forms of persecution. As a result, the number of refugees and asylum seekers arriving in Japan continues to rise every year. Beginning in 1979 with the Indochinese refugees, ISSJ continues to provide support services for refugees and asylum seekers in Japan.